What is the difference between this face and her regular face? You have to be a master of subtlety to see it. Or, you have to live with this creature full time. This face is ever so slightly bitchier than her usual face. 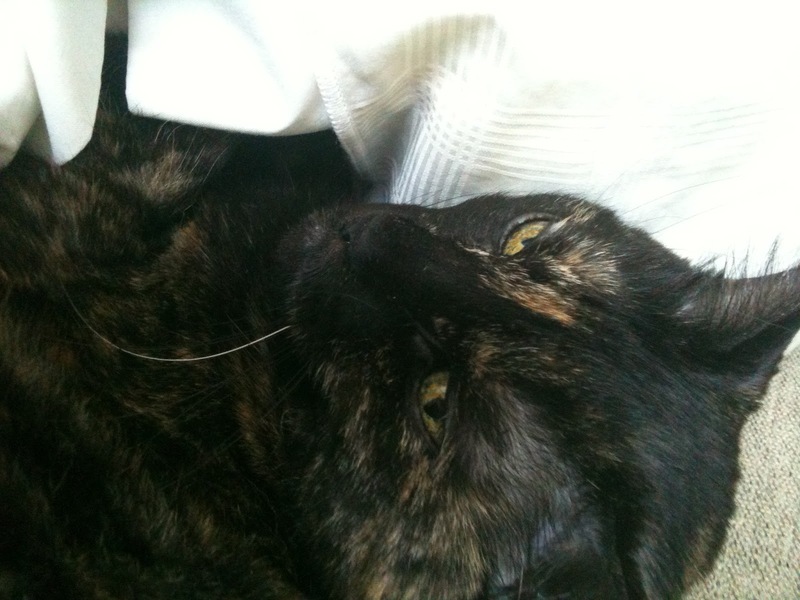 And a few degrees away from her really mad face. Clearly this is a subject of tremendous import to you. Anyhoo, the heat. 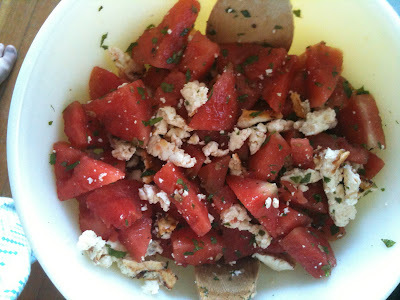 We had our book club meeting on a particularly vicious day, and as this installment was a potluck, I decided to make grilled watermelon, mint and feta salad. A more elegant version of this salad uses halloumi, but I couldn't find any. It grills a little more nicely, whereas feta is chunkier, messier, but no less delicious. For the cheese novice, feta is the closest in taste to halloumi. I don't know of any fruit that is more cooling than watermelon. Its high water content, sweet pink flesh and cool texture make it a summer favorite almost the whole world wide, and certainly in areas where it is grown. It's huge in the South (and you know how I feel about the South). (I used my George Foreman grill for this, but you can use a grill pan, a BBQ, or a regular pan). Slice and grill the feta in batches, slice, cool and set aside. Slice the mini watermelon into bite-size chunks, place in bowl. Finely chop mint, add to bowl with watermelon. Add cheese, lemon juice, oil, salt and pepper. Toss together thoroughly, serve. You can also refrigerate this salad to make it extra cool. Ahhhh. Fresh cool salad on a hot day. Beats all.